Waste is material information. Landfills are detailed records of everyday consumption and behavior; much of what we know about the distant past we know from discarded objects unearthed by archaeologists and interpreted by historians. And yet the systems and infrastructures that process our waste often remain opaque. 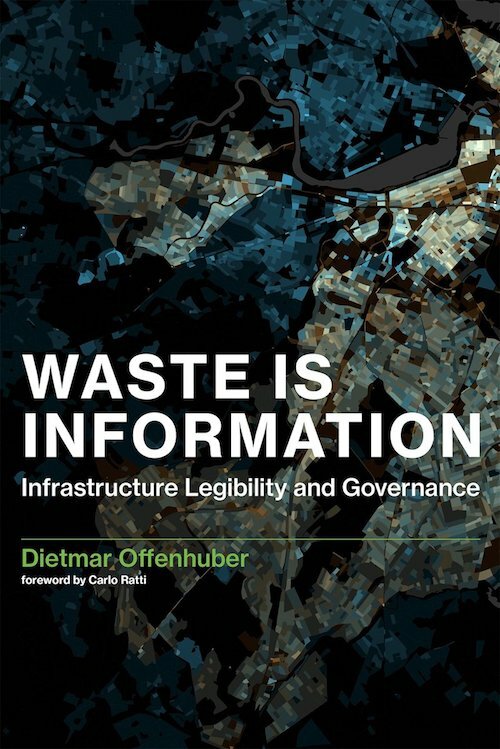 In this book, Dietmar Offenhuber examines waste from the perspective of information, considering emerging practices and technologies for making waste systems legible and how the resulting datasets and visualizations shape infrastructure governance. He does so by looking at three waste tracking and participatory sensing projects in Seattle, São Paulo, and Boston. Offenhuber expands the notion of urban legibility—the idea that the city can be read like a text—to introduce the concept of infrastructure legibility. He argues that infrastructure governance is enacted through representations of the infrastructural system, and that these representations stem from the different stakeholders’ interests, which drive their efforts to make the system legible. The Trash Track project in Seattle used sensor technology to map discarded items through the waste and recycling systems; the Forager project looked at the informal organization processes of waste pickers working for Brazilian recycling cooperatives; and mobile systems designed by the city of Boston allowed residents to report such infrastructure failures as potholes and garbage spills. Through these case studies, Offenhuber outlines an emerging paradigm of infrastructure governance based on a complex negotiation among users, technology, and the city.